Are you looking for a user-friendly tool that makes working with Salesforce even easier? Would you like to export your output as a .docx or .pdf and produce corporate-design-compliant quotations, presentations or reports at the click of a mouse? And would you like to query more complex data structures? This is where PARX DynaDoc comes in. People spend large amounts of time collecting data and producing content, as well as on producing the final documents themselves. You can quickly find yourself spending hours formatting your output files. The entire document production process often takes up a huge amount of time, with errors and inconsistencies in corporate design easily creeping in. With PARX DynaDoc, we are offering you a high-performance API with an attractive pricing model, which can be rolled out quickly and easily and is intuitive to use. You can easily produce your documents and presentations using data from all Salesforce entities on an automated basis. 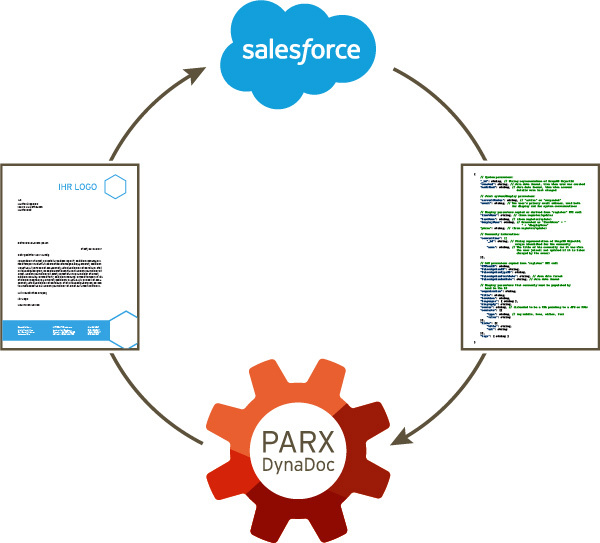 PARX DynaDoc is a Heroku-based function that is used to generate Salesforce files in standard formats (e.g. docx, pdf) and query more complex data structures. Produce complex documents, presentations and reports directly in Salesforce. With just a click of the mouse, prepare quotations and plans from objects and lists. PARX DynaDoc is already successfully used at a wide variety of renowned companies. Boost your company’s performance and contact us. Contact us for a meeting without any obligation and profit from DynaDoc. It's a pleasure for us to answer your questions.